The mission of the LEAP program is to help youth from underserved populations succeed in sport, school, and life through mental skill building. Sport Psychology Program team members empower participants to reflect, recognize their potential, understand how to reach it, and to make sound, thoughtful decisions along the way. LEAP becomes a bridge to the future, using sport participation as a catalyst to help youth apply these skills both on and off the field. Through participation in the LEAP program, youth learn sport psychology techniques and team building in a supportive environment of positive reinforcement. Rather than focusing simply on sports, youth learn to use sport psychology to improve their life skills and develop respect for themselves and others. JFK University Sport Psychology department student-interns facilitate 60-90 minute workshops monthly or bi-monthly with local partner organizations, supervised by Certified Mental Performance Consultant faculty. 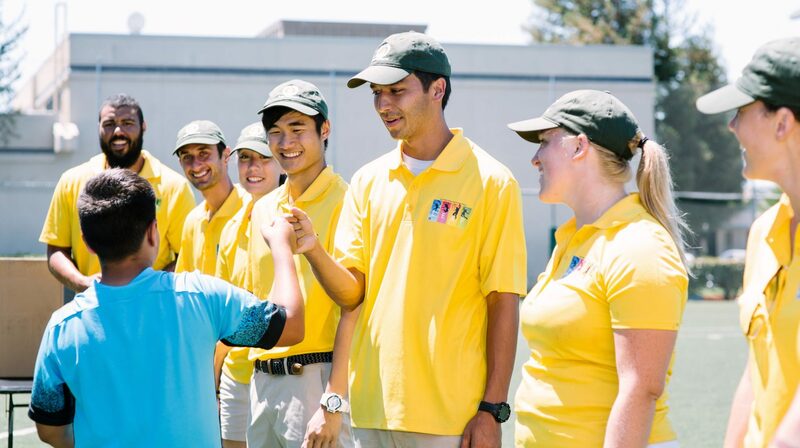 Partners include De La Salle Academy (Concord, CA), East Bay Soldiers (Richmond, CA), ACE Kids Golf (Oakland, CA), and Bay Area Outdoor and Recreation Program (Berkeley, CA). The LEAP Challenge Camp is held at Orin Allen Youth Rehabilitation Facility (OAYRF) in Byron. This camp has been in place since 1991. OAYRF is an unlocked facility for boys ten to eighteen years in age who have been incarcerated for engaging in criminal behaviors. The LEAP Challenge Camp teaches mental training skills that can be applied as life skills, enabling participants to make better choices and decisions, and to become productive members of our community. The week culminates with a visit to a ropes course where the boys apply the skills they have learned. The LEAP Sport Specific camps include sites such as Skate Like A Girl (2018) and Leadership Public School (Richmond). Youth participants ages 7-18 learn performance enhancement techniques, including positive self-talk, goal setting, imagery, and communication. LEAP teaches proven sport psychology techniques – such as goal setting, relaxation, concentration and positive self-talk – in an interactive and non-traditional games environment of through sports participation and then helps youth apply the techniques to other aspects of their lives. John F. Kennedy University is extremely grateful for the generosity of all LEAP benefactors and supporters. Donations to the LEAP Program help to sustain LEAP’s presence and involvement in the community. Your support will help fund the yearly summer camps including the Challenge Camp at Orin Allen Youth Rehabilitation Facility and the Sport Specific Camp helping underserved youth participating on sport teams, as well as workshops with community athletic teams, clubs and organizations. LEAP is proud to recognize our trusted partners in the community: De La Salle Academy, East Bay Soldiers, ACE Kids Golf, and Orin Allen Youth Rehabilitation Facility. To learn more about LEAP’s ongoing services, contact LEAP@jfku.edu or 925-969-3413. Support the LEAP Program and donate today.